Star Trek is 40 today. Happy birthday, Star Trek! Yes, it’s longer than Alex has been around, and yes, like Alex, no one originally expected it to last anything like this long. But the similarities end there. Star Trek never curled happily by my feet or licked my face to cheer me up. A few years later, having by now seen plenty of Star Trek on TV (the original series and the animated one), my friend David and I were confirmed Trekkie nerds. My mom took us on a subway ride into Manhattan to visit a short-lived mecca for Trekkies called “The Federation Trading Post,” a store full of Trek memorabilia, which at that time was sparse and hard to find. The tiny store was itself hard to find! But once you did, you could buy phaser and communicator props, scripts of all 79 episodes and audio cassettes of some (not videocassettes — VCRs wouldn’t appear in average homes for a few more years), rubber Spock ears, all the James Blish books, etc. Most of the really cool things were not within our budget, but we did score The Starfleet Technical Manual, the Star Trek Blueprints, a couple of blank Trek-uniform shirts and the insignia patches and gold braiding to sew onto them. I got a gold “command department” shirt; David got a blue “science” one. Back at home, I asked my mom to sew on my insignia and braids, showing her the exact specifications (to the millimeter!) from the Star Trek Technical Manual. Bless her, she made it perfect. Thanks, Mom! For a short time thereafter, David and I instituted our own “Starfleet Academy” at which we would wear our “uniforms” and practice flipping each other and rolling to our feet á là Captain Kirk. 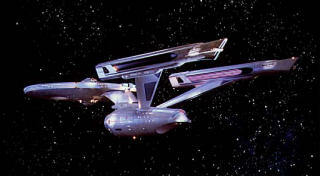 Of course I’ve long outgrown most of that, but to this day there is still a model of the Enterprise-A on my desk. It’s the most beautiful of all sci-fi spaceships. I should find that cassette tape of one of our Star Trek meetings and podcast it! Previous PostPrevious We’re number one?